Like most of the projects we embark on, this pre-existing kitchen faced a much-too dated existence. Linoleum cabinets paired not so kindly with tarnishing wooden floors, and well you get the rest. 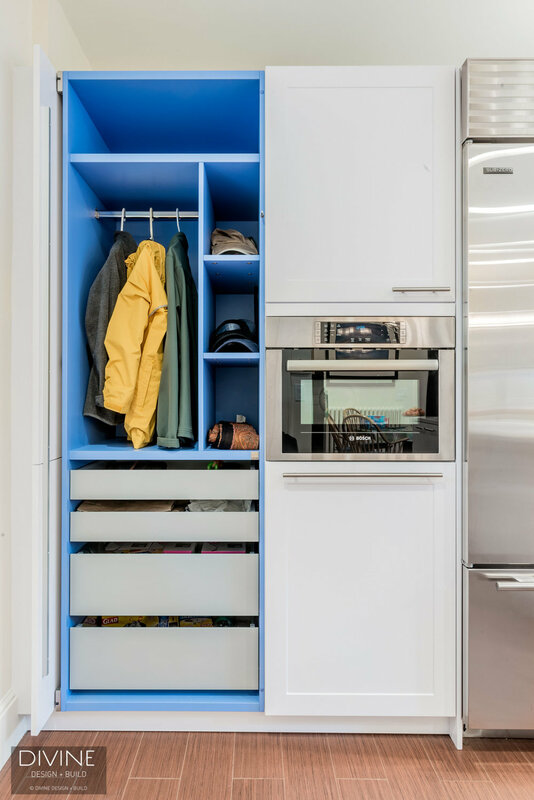 With that said, Divine Designer Jana Neudel sought to provide a kitchen for her clients that was both serene in nature but maintained a quirkiness indicative of the couple who would eventually be cooking in the space. With this in mind, Jana went ahead and recommended German cabinetmakers Leicht in the initial feasibility stages of her design process. While Leicht has a reputation for manufacturing ultra modern, contemporary cabinets, this kitchen showcases Leicht's ability to also produce transitional, traditional and shaker-style door-fronts suitable to the gambit of tastes. Another interesting element in this kitchen stems from the flooring choices. These clients, specifically, had voiced concerns over their previous hardwood floors and the amount of wear and tear shown on them over the years. Jana saw this as an opportunity to try something a little different. The designer found a common ground. For, the couple of this Cambridge home still appreciated hardwood flooring and its general aesthetic verisimilitude. The answer? Porcelain tile faux-finished with the look of a natural wood plank. Subsequently, the tiles came from Daltile and the manufacturer's Yacht Club collection. The clients are thrilled with the "organic" design of the floors themselves, but also find refuge in their easily-maintained upkeep and appearances. After the floor is laid, comes the fun part. The kitchen island and countertops are hand-selected quartz slabs from Cambria. 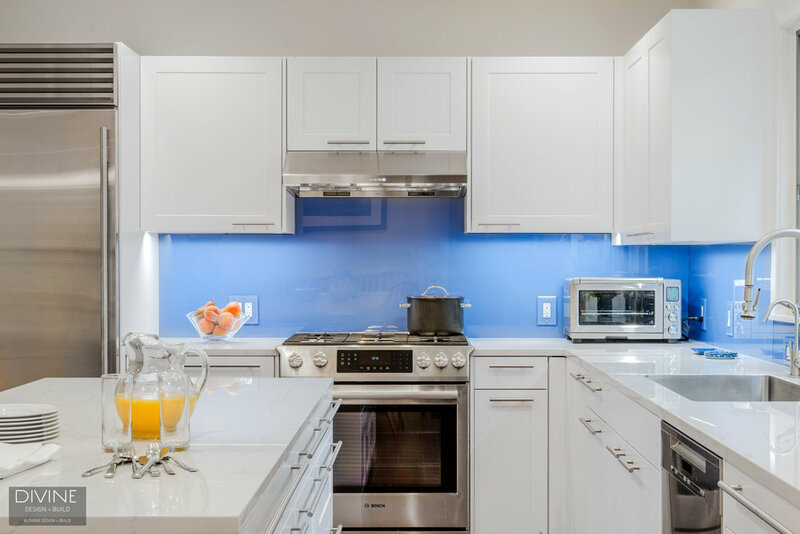 Next, the glass backsplash is custom painted to affect the serenity of oceanic blues. For appliances, Jana and her clients selected a Sub Zero refrigerator, a Miele dishwasher, and a Bosch built-in speed oven. The Zephyr under-cabinet range hood was also a new addition, that now hangs over the client's original gas range and oven setup. Furthermore, contemporary accents found in the kitchen's handles and pulls are stainless steel accessories from Richelieu.